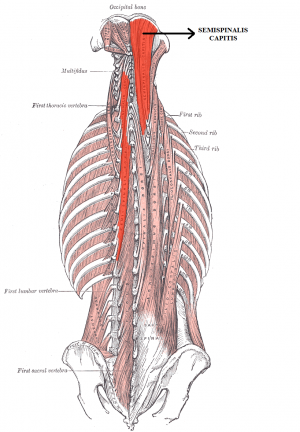 The posterior muscles of the neck are divided into four layers. The semispinalis capitis and cervicis muscles lie within the third layer. The semispinalis capitis is a long slender muscle which provided a long moment arm to provide efficient extension. The muscle originates on the articular processes of the C 5, 6, 7 and 8 as well as the transverse processes of T 1, 2 ,3 ,4 ,5 and 6. The semispinalis capitis attaches onto the occiput inbetween the superior and inferior nuchal line. Greater occipital nerve, which additionally innervates the scalp. Acting bilaterally : Extension of the head and neck. ↑ Rezasoltani. A. Kallinen. M . Mälkiä. M. Vihko. V. Neck semispinalis capitis muscle size in sitting and prone positions measured by real-timefckLRultrasonography. Clinical Rehabilitation 1998; 12: 36–44. ↑ Natsis K, Baraliakos X, Appell HJ, Tsikaras P, Gigis I, Koebke J. The course of the greater occipital nerve in the suboccipital region: a proposal for setting landmarks for local anesthesia in patients with occipital neuralgia. Clinical Anatomy. 2006 May;19(4):332-6. ↑ Porterﬁeld JA, DeRosa C. Mechanical neck pain,fckLRperspective in functional anatomy. Philadelphia: WB Saunders, 1995.